Home / Articles / Are you too old to wear vintage? Are you too old to wear vintage? I’ve heard a few people claim they’re ‘too old to wear vintage’ over the past few months, and it got me thinking. As my 40th birthday looms ahead of me I’ve started wondering whether I’m ‘getting too old’ to be wearing certain things. ‘Madonna doesn’t let it worry her, and she’s almost twice your age‘ a kind friend said, but frankly while Madonna is a lot of things, my personal style inspiration she is NOT. She’s also no advocate for growing older gracefully which I like to think I could do. However I find the idea of being ‘too old to wear vintage’ a strange one. As you go through life it’s very easy to get caught in a rut of (for example) wearing jeans every day, and slowly you lose the confidence to wear anything else. When it comes to having to dress-up you suddenly realise you’ve forgotten how to. After I had a baby I had a long period of very little sleep and general life upheaval when I lived in jeans and t-shirts. When I started to introduce some vintage back into my wardrobe after about 5 years of vanilla-dressing it was a scary thing. I dreaded people stopping and staring at me, or nudging each other and sniggering, or coming out with the dreaded ‘ Oh you are brave to wear that’ (now there’s a backhanded compliment if I ever heard one!). But it didn’t happen. Nobody even asked me ‘is that vintage?’ – friends just told me I looked nice. My mum heaved a sigh of relief that I was snapping out of it. People I didn’t know came up to me and said ‘Oh, I love your jacket’ – something which never happened when I was going through my vanilla phase. Wearing vintage is about exploring your own individuality, about wanting to own items which are unique and special and not blending in with the crowd. It’s something to enjoy, to play with, to celebrate! So, in answer to my earlier question, NO, you’re never too old to wear vintage. Nobody’s saying that you should wear pin-up dresses or victory rolls every day (unless you want to). The key is to wear what you love and what you’re comfortable wearing. No, strike that, DON’T wear what you’re comfortable with, wear something that’s a little out of your comfort zone every day and watch your confidence soar! up and about shopping. She was always clad in a calf length dress or coat with long beads and court shoes, with lipstick and her hair in an up do. She looked as though she’d just stepped out of the 1920’s. She’s still an inspiration to me now. She sounds fabulous, I wish I could have seen her! Maybe the rule of thumb is not to wear clothes that look like you haven’t shopped for clothes since you were in high school. It takes a while for woefully out-of-date to turn into fashionably retro. Wearing clothes that looked great when we were 17 doesn’t make ourselves look 17. But wearing clothes that looked great when my mom was 17……..that becomes a fashion statement. And often those clothes (1950’s for mom) and my grandmother’s decade (1930’s), look great on a middle-aged woman. I think that’s a good way of looking at it. It’s also easy to get into a rut (whether in your teens or 20s) of wearing a certain type of clothes and sticking with that style FOREVER! You have to re-invent yourself once in a while I think and wear whatever you like – everyone’s different aren’t they? By the way, you look absolutely fabulous in that Sixties style. I’m nearly 60 and the era’s keep rolling back for me. The elegance of the 20’s and 30’s fascinates and inspires me. I wear vintage every day – it may not be a full outfit , but there is always something special for the day to link me to the past. 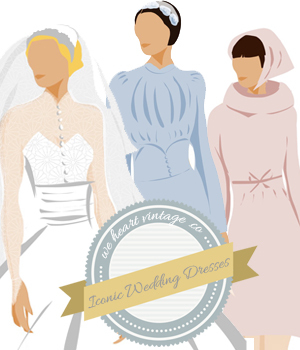 Just waiting on delivery of 3 1920’s dress patterns!! Oh wow, how exciting. Do you make a lot of your clothes? I’d love to be able to make clothes from vintage patterns, but I just don’t have the skill, patience of dexterity (plus I have arthritis in my fingers!). I like to try and wear at least 1 piece of vintage every day too, even if it’s with jeans and a t-shirt!